Michael Vistia Dog art as Seen in Westminster Kennel Club WKC dog show commercials and Ads. Over 100 punch needle patterns punch needle kits are available, as well as Rug Punching Patterns, rug punching Kits and Rug Hooking patterns. 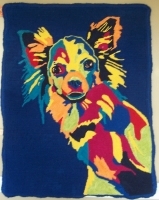 The Bee Skep is excited to have joined with Michael Vistia to offer his unique dog and cat designs as Punch Needle patterns/kits, Rug Punching Patterns/Kits and Rug Hooking patterns. 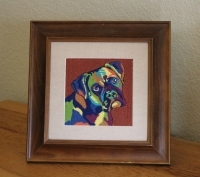 His dog and cat designs make great fiber art projects and are fun to do.